Formlabs is pleased to announce the latest addition to our library of Form 2 Engineering resins: Elastic Resin. Elastic is the most pliable of our Engineering Resins, with a Shore durometer rating of 50A as well as high elongation and shape recovery. Parts printed in this material look and feel like molded silicone parts, and are durable enough to resist multiple bending cycles. Read our support article linked below for a deeper look at how to support and orient parts for printing with Elastic Resin. 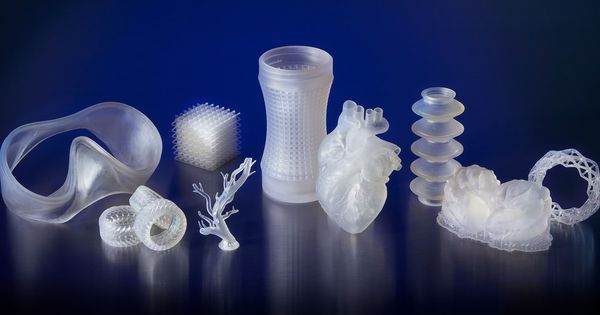 We developed Elastic Resin for applications in wearables, medical models, robotics, and special effects parts – but we can’t wait to see new applications emerge! Let us know what you think, and we’re happy to share more information. Very cool! I’m using flexible resin on a project right now that will eventually be a silicone overmold. It will be great to be even more accurate (material property wise) for future prototypes. There’s something I’ve wanted to try for a while. I make jewelry with lots of details so I’m always fighting with the supports placement since they tend to muddy up detail. I had thought that instead of printing the piece itself, I should print the mold instead. That way I could keep the supports away from the detail much more easily. I usually have a silicon mold made from my prints, which has to be fairly flexible to get the wax from the mold. So the flexibility of this new material got my attention, but maybe the detail wouldn’t be up to it? What do you think about printing molds for two part plastic casting ? People are currently printing a master use to make a silicone mold and then cast the part, would it be possible to skip the silicone mold step ? The new Elastic resin is great at a lot of things that other resins can’t do, but as the support article describes, it’s difficult to reproduce very fine details in it. A more elaborate solution for your work might be to print a rigid mold to avoid supports on your details, cast a soft or semi-soft Urethane (or other resin) master from that, and then use that master to make a soft enough silicone mold for your waxes. I think printed Elastic molds would work well for some smooth and rounded parts, but getting crisp edges and high levels of detail will be easier done with other methods. I’ve been doing a lot of printing with Elastic but I actually haven’t tried a silicone-like mold for wax or 2-part resin casting yet. Thank you for that. My work around has been to print in the castable resin and let the caster made a mold from that. It works quite well. I just get a little annoyed sometimes at having to design around supports and sprues. my feeling would be that ALL rubber molds are sacrificial. That is- they wear out with use and must be replaced. A Poured silicone mold is always going to be significantly less costly than a printed rubber mold in terms of materials cost, and time, and a poured mold will always capture a molecular level of detail- whereas any printed rubber mold will be limited by layer artifacting. what’s the best way to color this resin? Food Color? Also, how do i prevent over-shrinkage? With no warranty expressed or implied, the methods that others have used to color clear resin should work with Elastic. I’m not sure I know what you mean by over-shrinkage, though. Elastic resin will reversibly swell when exposed to IPA, so it’s a good idea not to wash it for too long, especially when the part has thin features, or the distortion introduced by that swelling could be permanent. Printing in Elastic is so much faster and easier than casting silicone rubber from 3D printed molds. I printed a 2mm thick wrist strap using Elastic but even with direct rubbing off of resin in an IPA bath for 10 minutes and curing 20 minutes at 60C, the surfaces remains very tacky (as if resin residue remains). The IPA is 95% and new. I am concerned about too much IPA exposure (is 10 minutes the maximum exposure time?). I am planning to print for user testing prior to committing to tooling, but need non-tacky parts. Any suggestions? Get 99% IPA. I had tackiness with any lower concentration of IPA. Put your part inside a clear plastic jar or plastic bag full of water inside your curing machine, or a bowl of water with something to hold the part down. This is what I mostly do, and I’ve got a lot of tack-free Elastic parts on my desk. Coat or submerge your part in glycerine/glycol during curing. I’m getting some amazing parts from Elastic. I design medical devices that are often made in TPEs or silicones and this is giving us a way to prototype like we have never been able to do before without a slow expensive messy casting processes. Getting a functional soft rubber model in a few hours is awesome. Any way to make it slightly softer? like 30 or 40 Shore(A)? Any way to nicely remove the supports? The remaining pips are really tricky to remove, and you can’t really sand the material well. We have best results scraping the surface with a sharp blade, but it’s not ideal. They work great as functional test parts, but not as cosmetic ones. We’re glad to hear you like what you can do with Elastic! It can be slow, but one way for a better appearance and feel can be to use flush cutters to cut the support while you’re pulling it away from the surface. Then, the cut area pulls back into the surface of the part, leaving a more subtle mark than just cutting it without tension. You may also want to play around with whether you remove supports when the part is freshly printed (soft, some risks of tearing part while removing supports), after rinsing (very soft, easier to remove supports but a higher risk of tearing), or after post-curing (stiffer part, lower risk of tearing, but more difficult to remove supports). In any state, I like to use scissors to cut away most of the supports before going in with flush cutters to try and get a good finish. There may also be more techniques for finishing Elastic that haven’t been figured out yet. I don’t personally know of any way to make it softer than it already is. It might be close to that soft when soaked in IPA long enough, but I don’t think those parts would be very usable, and they’d gradually dry out and harden somewhat even if they retained that IPA-swelled softness for a few hours. I have yet to play with Elastic, but some tricks from Flexible may help. After finishing your cleaning and curing procedure (I also use a mechanical means to assure a clean surface (brush with IPA)… freeze the part, and file and sand. You may need a couple of times in and out of the freezer. Granted not all parts are sandable because of geometry, this works WONDERFULLY for Flexible to remove and tackyness and give it a beautiful satin (to the touch) finish. If you have a media blaster the freezing forks for it too. Any way to nicely remove the supports? Flexible parts could be put in the freezer after post-curing and support removal was cleaner and it was possible to sand the parts. Interesting idea with freezing. Thank you. I will give this a go. I have been printing some small parts that contains 2mm diameter tubes, this goes well for small tubes but as the tubes get longer i noticed that the tubes get clogged. I suspect that the uncured resin that is stuck inside the tubes cures as it is exposed to the light of the laser while it is printing successive layers. Is there a way of fixing this ? I have been thinking about colouring the resin with a dye that blocks the laser light. But i do not know if this will be possible ? And what kind of dye (or powders) can be recommended to experiment with ?